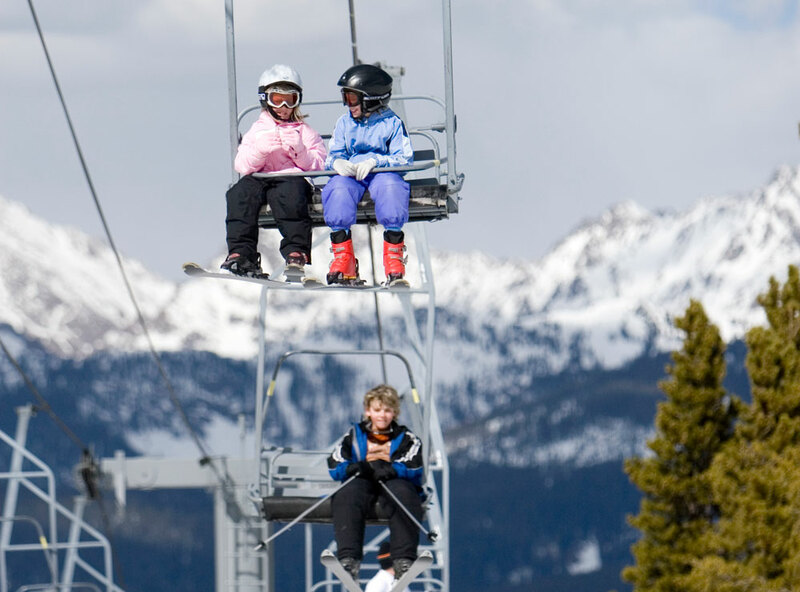 Colorado ski areas offer acclaimed ski-school learning programs that are the perfect springboard to a lifelong love affair with the slopes. Whether you’ve tried skiing or snowboarding a few times or you want to make that inaugural Colorado mountain trip, taking a professional lesson will help you get the basics down and improve your technique more quickly. Designed for kids, adults and those of all skill levels, nearly every Colorado ski resort has a learning program to get you started. Below are a few examples of the unique programs offered. And don't forget, January is Learn to Ski & Snowboard Month, when many resorts offer great deals on lessons for beginners. Front Range favorite A-Basin offers flexible lesson plans with 4 Lessons 4 You, which gets you four fully transferable lessons that anyone in your family can use during the regular snowsports season. While it's known for expert terrain, the ski area has two mellow learning areas and scenic beginner terrain — so the whole family can enjoy the gorgeous views from the slopes. The four Aspen/Snowmass mountains have a variety of specialized ski-school programs, including lessons for preschool-age kids, teens, adults and seniors. The Teen Park & Pipe Camp uses the site of ESPN's Winter X Games to perfect mountain moves, and the Women's Edge skiers' program is a four-day, women-specific camp that has been creating friendships for more than 25 years. For those looking for something a little different, Beaver Creek's Nordic lessons take students into the White River National Forest backcountry to learn snowshoeing, cross-country or telemark skiing. Breck's Ultimate Four semi-private lesson is the ideal combination of a large-group and private course, giving the maximum four participants plenty of one-on-one time with the instructor. Woodward at Copper offers a year-round indoor ski and snowboard camp with foam pits, trampolines, simulated snow and more to allow riders to test their skills before launching outdoors. Extremes with Ease is one of the mountain’s newest lessons, taking groups down powdery bowls on some of Crested Butte’s legendary untamed terrain. Groups of four to eight intermediate skiers and snowboarders head out with instructors for skill-focused sessions. Purgatory has embraced a recent snow-sports trend: the snow bike (basically a bike with skis instead of wheels). Everyone who rents a snow bike at the resort is required to take a certification course before they head down the mountain on one of the easiest-to-learn modes of snow transport. Camp Keystone is more than just a ski school for your kids. Sure, they'll learn to ski and snowboard, but they'll also participate in lots of other winter activities, including kids' nights out, themed days and other snowy fun. Loveland Explorers is a six-week program held in conjunction with the Loveland Racing Team, where coaches work with intermediate and advanced skiers and snowboarders ages 7 to 14 to develop skills throughout the season. On a handful of Wednesday afternoons, Monarch offers ski and snowboard clinics just for women that take skills to the next level in a fun, non-competitive environment. Powderhorn has clinics for those interested in learning a variety of terrains, including telemark, moguls, powder and more. For those who might not have hit the slopes in awhile, Ski Cooper's technique improvement program gives skiers the choice of what they want to improve on and helps take you to the next level with with today's techniques. Instructors at Ski Granby Ranch's ski and ride school utilize the Haral Harb teaching method, which utilizes specific body movements and shaped skis to get students on the slopes and confident with the fundamentals. Steamboat’s three-day Billy Kidd Race Camps match intermediate to advanced skiers with trainers hand-selected by Olympic medalist Billy Kidd. Video replay gives immediate analysis, and music and commentary are dubbed in later for a take-home DVD. Sunlight's Williams Peak Backcountry Clinics take alpine and telemark skiers and snowboarders on a half-day tour of Williams Peak, home to steep ridges and broad powder bowls, where some of the Western Slope's most powder is known to fall. Telluride also has a backcountry program, which takes adventurers and private instructors to the resort's hike-to terrain in search of pristine powder and untouched chutes. Vail's Adventure Sessions are great for those who want to see the mountain like a local, including a guide that will take you places you haven't found before and help you make the most of your ski day. Winter Park has also embraced the ski-bike phenomenon in a unique way. When the sun goes down and following some instruction, the resort's guides lead ski bikers with head lamps down the mountain in the dark of night. Learn more about Colorado's 28 ski resorts, find the best ski resorts for families in the state, discover off-slope winter activities for kids or night activities at Colorado ski resorts.